Ohio is a state of the north-central United States in the Great Lakes region. 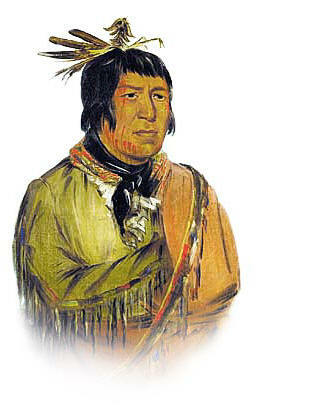 The tribes of the Iroquois Confederacy drove out the native tribes of the Ohio valley during the Beaver Wars. There are many famous Native American tribes who played a part in the history of the state and whose tribal territories and homelands are located in the present day state of Ohio. The names of the Ohio tribes included the Illinois tribe (Illini), Iroquois, Chippewa, Delaware, Erie, Ottawa, and Potawatomi (see above picture), Kickapoo, Kaskaskia, Miami, Wyandot and Shawnee. The climate, land, history, environment and natural resources that were available to the indigenous Indian tribes in Ohio resulted in the adoption of the Northeast Woodlands culture. Meaning of State name: From the Iroquois Indian word for "beautiful river." 7000 BC: Archaic Period in which people built basic shelters and made stone weapons and stone tools 1700 BC: Mound Builders culture, a feature of many Woodland tribes. Two of these mounds in Ohio are called "Serpent Mound" and "Alligator Mound"
1775: Lord Dunmore's War in Southern Ohio. Governor Dunmore commanded a force to defeat the Shawnee, Virginia, Pennsylvania and Ohio, down the Ohio River. 1785: Northwest Indian War (1785�1795) in Indiana and Ohio, also known as Little Turtle's war - see Little Turtle. The Americans suffered 2 humiliating defeats by the American Native Indians until they won the Battle of Fallen Timbers in 1794. The history of the European invasion brought epidemic diseases such as tuberculosis, cholera, influenza, measles and smallpox. The Native Indians of Ohio had not developed immunities against these diseases resulting in huge losses in population. Exploitation including the leverage of taxes, enforced labor and enslavement were part of their history, taking their toll on the Ohio Indians.